Amazon recently updated the software on Kindle ebook readers and changed the homescreen layout so that you can now scroll up and down to see more content, mostly ad recommendations to purchase more ebooks. Luckily the new homescreen view can be turned off if you don’t like it and just want to view a list of book covers like in the library view, and the classic Kindle list view is still available as well if you prefer to view a list of books without covers on the homescreen. To turn off the default homescreen on your Kindle, go to Settings > Device Options > Advanced Options > Home & Library > Home Screen View. They don’t make it easy to find; it takes seven taps to find the setting to turn it off, but at least it’s there. Turning off home screen view essentially makes it so the home button takes you to the library view instead, which shows 6 book covers by default. There’s also a secondary list view that’s easy to overlook because the setting is hidden in a dropdown menu. To turn list view on, tap the sorting option in the library list where it says All Items and select “List”. 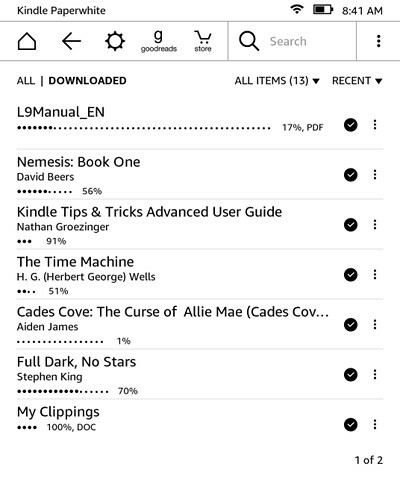 With list mode turned on you can view more titles at once than when using cover view (except when using the Large display mode option on the Kindle Oasis 2, in which case it shows 6 books either way). List view also has one advantage over cover view. It displays a line of dots below each book that indicates how long the book is and it also shows how much you’ve read. At one point Amazon removed the dots with a software update but enough people complained about it they actually brought the dots back with the next update. Oh thank you so much! That new home sceen view was a bit irritating. Also I like the list view even better! Thank You!!! It’s too hard for me to read the tiny book covers. 6 bigger ones per page helps alot.